Western University of Health Sciences’ College of Osteopathic Medicine of the Pacific (COMP) celebrated Match Day on its Pomona, California, and Lebanon, Oregon, campuses March 18, 2016. 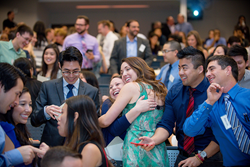 Match Day is a national celebration where medical students find out the residency they will attend after graduation. Four years of hard work led to one envelope that contained their future. When the clock struck 9 a.m., students in COMP’s Class of 2016 opened envelopes containing their residency locations and reacted with shouts, hugs and tears. Of the 198 students who matched in Pomona as of March 18, 120 placed in Accreditation Council for Graduate Medical Education (ACGME) residency programs, 70 placed in American Osteopathic Association residency programs, and eight placed in military residency programs. Fourth-year COMP student Emmeline Qin matched into the Los Angeles County-University of Southern California Medical Center Pediatrics Residency Program. She was so nervous she had her husband open the envelope for her. Qin said she sees pediatrics as an opportunity to help patients at an early stage of life. Qin is one of 112 COMP-Pomona students who matched into primary care, or 57 percent. A total of 102 COMP-Northwest students participated in the Match, and more than half landed programs in primary care. Of the Class of 2016 in Lebanon, 53 matched into primary care fields, which include internal medicine, family medicine, pediatrics, and OB-GYN. COMP’s Match Day celebration keeps growing every year. Many students matched into their first choices and placed with their friends and colleagues, Warren said. After the students opened their envelopes, they were invited to the front of the lecture hall to announce their name, specialty residency program and location. Their information was pinned to an electronic map displayed on the lecture hall screens. Medical residency programs can range from three to seven years, depending on the specialty. For example, family practice is three years, while neurosurgery is seven years. Following residency, the physician is then able to set up practice in the community of their choice. Fourth-year COMP student Neal Christopher matched into the Loma Linda University Psychiatry Residency Program along with his close friend and classmate Aaron Gilmore. They announced their residencies together. Christopher said he had wonderful mentors, including COMP Dean Paula Crone, DO ’92, and Vice Dean David Connett, DO ’84, who helped prepare him for this moment. COMP Associate Dean for Academic Affairs Susan Mackintosh, DO ’92, MPH, provided a toast to the graduates in Pomona. Dean Crone gave a toast to the Class of 2016 in Lebanon as they began the next phase of their medical education.